Nothing beats the feeling of picking your own fresh, juicy red tomatoes for salads, sandwiches or fresh pasta sauce. But if you want your tomato plants to reach their full potential, they need height and something to climb. 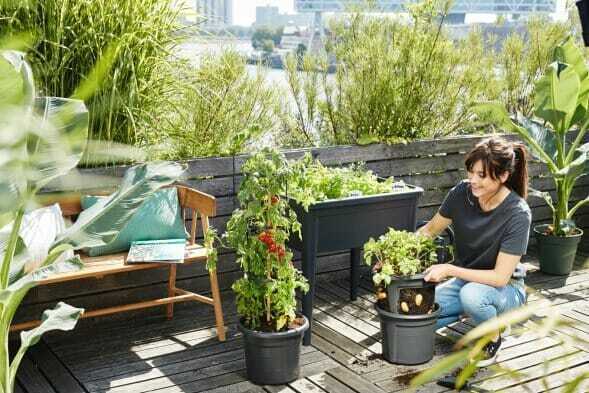 For urban gardeners growing their own vegetables on a balcony or roof terrace, or gardeners with small plots, it’s hard to find space for a complex contraption of canes and supports. Enter the elho tomato pot. This clever pot makes it easy for you and your family to grow, eat and enjoy your own tomatoes. The pot comes with a sturdy rack that provides support for your tomatoes to climb, and, because it’s modular, the system grows along with your plants. Tomatoes are thirsty plants and can be very demanding. The elho tomato pot makes it easy with a special watering system and three-litre reservoir that keeps your plants healthy and thriving. What’s more, the tomato pot contains recycled plastic and is made from sustainable materials. Helping you enjoy all the benefits of homegrown nature. Looking to grow different climbing vegetables? Don’t let the name stop you, the tomato pot is also the perfect home for plants such as cucumbers and peppers. And when Autumn arrives and your tomato plant has done its job, you can easily store the pot to use again next Spring. The support rack packs neatly into the water container, taking up minimal space. A smart solution for the big city, small garden vegetable farming. Nature makes you feel healthier, boosts your energy and makes you happier. Elho’s purpose is to inspire people to bring more nature into their daily lives. With the elho collection you can give room to nature in and around your home. At elho we are green in everything we do. Most of our pottery collection is made of recycled material, all of our pots last for a long time and are produced with 100% wind energy. Our aim is to be circular by 2020. Enjoy nature with elho in a sustainable way. Use elho’s colourful and stylish synthetic pottery collection to transform your house and garden into a great place to be. Whatever your taste, elho has a style that suits you. Elho is creative, innovative and has a green vision. Elho is proud that all products are made of recycled material and produced with 100% wind energy. The company is the leading innovator in Europe and has developed synthetic pottery in the Netherlands for more than 54 years. Give room to nature with elho.